The United States of America is exactly what it’s name says it is: States that united. These states were sovereign nations that came together to defend against a common enemy. As recently as 1992, in New York v. United States, Justice Sandra Day O’Connor wrote that the federal government (only) can encourage the states to adopt certain regulations through the spending power, or through the commerce power. The question then is: Has time made the 10th Amendment functionally obsolete? Or more specifically, has time made the states obsolete? While the states formerly were nations, today they merely are artificial, geographical boundaries. They do not define heritages, mores, lifestyles, beliefs, politics, religion or any other human traits. Consider, for instance, Illinois. There is approximately zero relationship between Chicago and southern Illinois, the latter whose residents resemble people in Kentucky or Tennessee, far more than people in Chicago. The same could be said of New York City, tucked into the southeast corner of a largely rural, heavily forested state. State boundaries lead to senseless legal differentiations: By what U.S. rationale does Texas enforce a death penalty while Illinois has none? We all are Americans. Is the need for a death penalty in Texas different from the need in Illinois? Why does the federal government allow abortions nationally, while some states put up barriers to abortion (and ironically, those states have a death penalty)? Why do voting laws, for federal elections, differ among the various states? It’s a U.S. federal election. Yet, some states demand more proof of eligibility to vote, than do other states do. What is the logic? Chicago’s public school system is insolvent, because Illinois is insolvent. So Chicago children suffer from lack of teachers, overcrowded and unsafe schools and lack of school programs. Were Chicago’s schools to be supported by the federal government, hundreds of thousands of American children would receive a better education. This would benefit all of America, not just Chicago. Is a division into financially struggling, legally byzantine states the most efficient, effective way to run a nation? If we had to start over, to build a government for 320 million people, would we divide it into 50 monetarily Non-sovereign entities, and allow each government to create its own unique laws — laws that may contradict the laws of neighboring states? 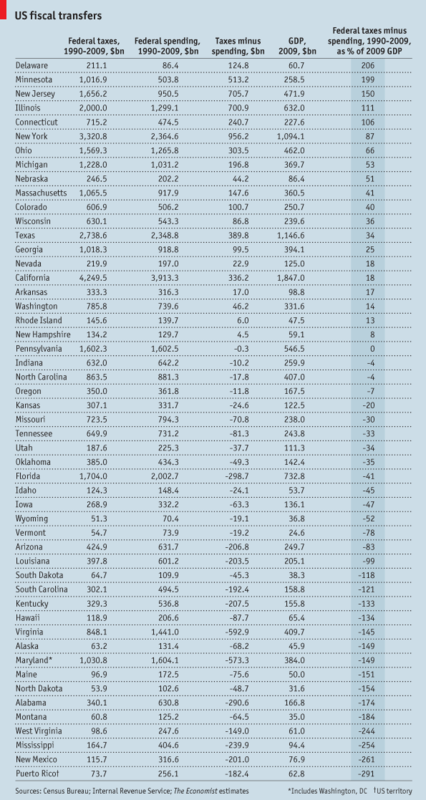 What governing advantage do states provide for the United States? Admittedly, there are socio-economic and cultural differences, within counties or even within cities. But it is far easier for voters to understand and to influence, the politics of a county or city, than of a state. Within cities and counties, the weather generally is similar, as is access to water, access to food and geology. State boundaries are arbitrary lines, drawn for outdated, political reasons, having no functional purpose. 1. Eliminate state, county and city courts; have all courts be federal. 3. Eliminate the functions currently operated by monetarily Non-sovereign states and hand them to the Monetarily Sovereign federal government. Lack of money would cease to be the all-purpose excuse for insufficient government services. (Despite what libertarians tell you, America’s biggest financial problem is not due to the federal government being too big. The problem is the state governments are too big and the federal government is too small. The entrenched economic crisis is leading people to either cut their personal spending to the basics or flee in search for jobs. Nearly 10 years into a deep economic slump, it is no closer to pulling out, and, in fact, is poised to plummet further. The unemployment rate is above 12 percent. The government has tried to boost revenue by hiking the sales tax to 11.5 percent, and closing government offices. A $58 million bond payment due Saturday went unpaid. If defaults continue, analysts say it will face numerous lawsuits and increasingly limited access to markets, putting a recovery even more out of reach. A list of cost-cutting measures proposed by a group of hedge funds that holds $5.2 billion of debt has riled citizens: laying off teachers; cutting medical benefits; and reducing subsidies to the main public university. Meanwhile, a report commissioned by the government called for wage levels to be lowered, paid holidays cut, and energy costs reduced. Some economists warn that measures like new taxes could further depress the economy, a concern shared by small business owners. Puerto Rico’s fundamental problems are identical with Greece’s: Like all euro nations, Puerto Rico and all U.S. states, counties, and cities, are monetarily Non-sovereign. To survive long term, all monetarily Non-sovereign entities (including you and me) require income to exceed outgo. In contrast, the federal government, being Monetarily Sovereign, requires no income; it creates dollars, ad hoc, by paying bills. Unlike the federal government, but like the states, we cannot create dollars at will. Without income, we cannot pay our bills. State governments receive income from several sources: Taxes, borrowing, tourism, net exports of goods and services, outside earnings, and importantly, from the federal government. There are important differences among these sources. Taxes remove dollars from the populace, and unless the state were to spend all tax dollars within the state (unlikely), taxes represent a net loss to a state’s economy. State borrowing must be repaid — plus interest — so borrowing never is a long-term solution to state financial survival. Tourism and net exports of goods and services can pay for and overcome the net economic losses caused by taxation. Tourists pay local taxes with dollars earned elsewhere, so tourism transfers dollars from one government to another. Similar in effect to tourism is: Outside earnings. A person might work and earn a salary from a company based in one location while living and paying taxes in another. Dollars are transferred from the “work” location to the “domicile” location. We see this often with suburbs, which survive on taxes earned in the neighboring big city. Dollars flow from the city to the suburb. In all of the above — taxes, borrowing, tourism, net exports of goods and services and outside earnings — Puerto Rico, the U.S. states and all euro nations, including Greece, are financially identical. They all are monetarily Non-sovereign, so cannot create money at will. The U.S. federal government creates dollars by spending, and it destroys dollars by taxing. To date, the federal government has created 13 trillion more dollars than it has destroyed: $13 trillion net dollars. From 1990 to 2009, the federal government spent $1.44 trillion in Virginia but collected less than $850 billion in taxes, a gap of over $590 billion. But relative to the size of its economy, Virginia derived a smaller benefit from America’s fiscal union than states like New Mexico, Mississippi and West Virginia, where the 20-year transfer exceeded 200% of their annual GDP. Transfers to Puerto Rico, which is a US territory, not a fully incorporated state, exceeded 290%. New York transferred over $950 billion to the (federal government) from 1990 to 2009. But relative to the size of its economy, Delaware made the biggest contribution, equivalent to more than twice its 2009 GDP. The states in the upper half of the chart sent more dollars to the federal government than they received. They are being bled — unnecessarily — by a government that neither needs nor uses those dollars. It creates its own dollars. Interestingly, Puerto Rico receives, proportionate to its GDP, the most dollars from the federal government, and still it suffers economically. One is left to wonder where the money went, and how bad Puerto Rico’s economy would be without federal support. I don’t know the specifics of Puerto Rico’s financial condition. Do Puerto Rico’s failures, resemble the failures of my home state, Illinois, because of intense political criminality? (Illinois politicians routinely are sent to prison, and many more should be.) Or does Puerto Rico have a different problem? I don’t know. But I do know there serves no public purpose for the citizens of Puerto Rico or any state, to suffer austerity because the state engages in a futile effort to pay its debts. All of the above shows why U.S. state governments serve no purpose and should be eliminated. The federal government should stand in for the states, supplying services and dollars directly to counties and cities, without state government intermediaries. 6 Responses to –The end of American states? We have a somewhat similar federal system in Australia. Your recipe for unity of state finances with federal finances seems a very reasonable one. I was wondering if that was what you meant in point 3]? The states could do the admin work, like here where they run the hospitals, but all bills come from Treasury via the CB, Etc. Right now state taxes are revenue so that would disappear. Since most people are ignorant of MS that is a huge mouthful to swallow and digest! I wasn’t aware of the Australian system. How does it work? Not sure states ultimately would be needed, even for administrative work, but that would be a transitional step — something close to what Medicaid or federal highways are now. I’m not au fait with the details but it’s a Federation of 6 States and 2 Territories. Each State has it’s own laws but the Commonwealth Government is gradually absorbing more and more of the original laws. It has an annual meeting to distribute the tax revenue [[it says that but we know different] according to an arrangement worked out to compensate the poorer states like Tasmania, and gives relatively less to wealthier states like Western Australia and NSW. Then the states share the GST revenue and they have land taxes and sales taxes like for property purchases. There is always bickering but it seems to work well enough. Income tax is a Commonwealth tax as is the Medicare levy etc. What would happen to the Legislative branch? Would there still be two houses? If not by State, how would they be elected? It makes sense to me to redraw some State lines, to make states more homogeneous, and to split up large and diverse ones like your examples of Illinois and New York. And California. Redraw the time zones while we’re at it, too ( I crossed between Mountain and Pacific 5 times today while driving north on US 95 in Idaho). But there is a tradition of a variety of policy choices among the states. What would happen if South Dakotans, for instance, had to agree with (or were forced to abide by the decisions of) New Yorkers on energy policy, bank charters, speed limits, etc.? I disagree Puerto Rico is fundamentally like Greece. Greece uses a foreign currency and borrows in a foreign currency. Puerto Rico uses the same currency as all US states. The euro zone has no federal system where the US has automatic stabilizers which are counter cyclical and help states (and Puerto Rico) in times of dire economic straights. The euro zone has no FDIC so banks, like in Greece, have bank runs, because their deposits are not guaranteed and they don’t know if they are going to be on the euro or drachma tomorrow. You see no bank runs in Puerto Rico. Greece and the other euro countries have inflexible rules whereby they are supposed to deficit spend more than 3% of GDP. We have no such inflexible rules. Greece and the other euro countries are literally being starved for cash. Greece gets less than 10% of the so-called bailout loans, the rest going directly into European banks. Greece is in no way like Puerto Rico except that both now have big debts. But Puerto Rico will survive and Greece may not. Puerto Rico, and all the US states, are monetarily Non-sovereign. They use the dollar, which to them, is a foreign currency — a currency of which they can and do and have run short. Re. “automatic stabilizers,” the post mentions that Peurto Rico does benefit from a surplus relative to the federal government. In this, it does have an advantage over euro nations. Greece and Puerto Rico both will survive, as will Illinois and Spain and other monetarily Non-sovereign entities — just in different ways.